Love the snoozing kitten and the crystal animals, especially the mouse. Cute. I like mice, especially when they're wearing little satin waistcoats with shiny brass buttons! I have been enjoying this thread and all of the picures of David and Kerry's favourite things. You have some memorable and quaint ornaments there David, and Kerry. I was touched immensely by the pot plant that you continually nourish in your Mum's memory. No doubt, it has survived so long, because of her presence there. David, you must treasure all these things that your mum collected over the years. 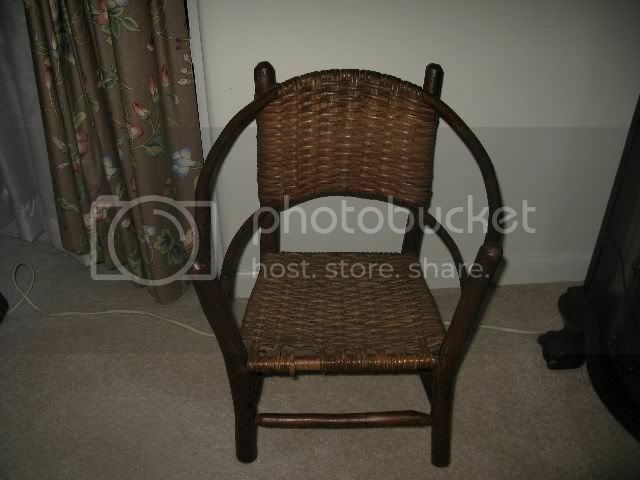 I have finally taken out my camera, and taken a few photos of things around my home that are special to me. I can see you are both interested in nice china, and the first one is a tea set made from English bone china that my mother in law gave me when I got engaged, 41 years ago. 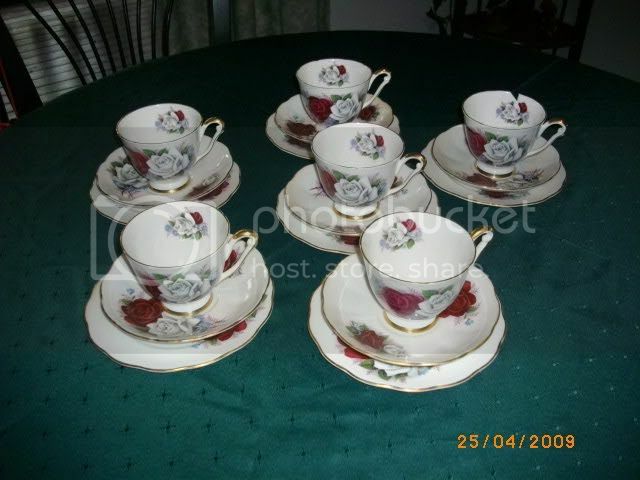 This second pic, is of another tea set, I bought from a garage sale at an old country property, some years ago. Heres a few other favourite things around my home. 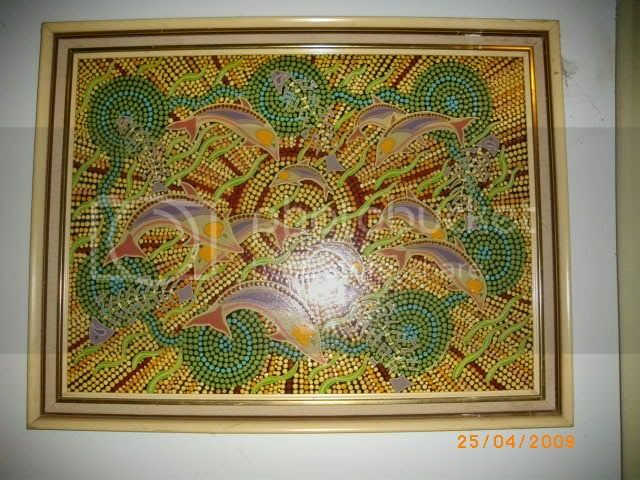 The first is a painting by my cousin, who has Aboriginal heritage. He is recognised as one of the best Aboriginal Artists in Australia, has sold paintings to Greg Norman, and has some of his works hanging in Parliament House. This one depicting dolphins and sea urchins, was a gift from him. 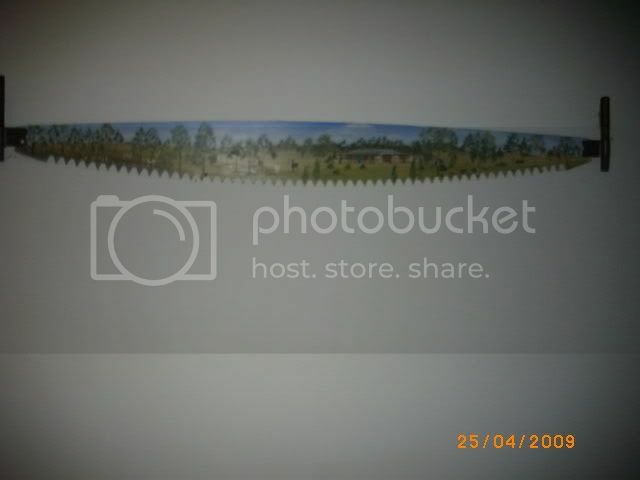 The second is a cross cut timber saw, with a montage of the farm we used to live on, painted on it. This was painted by a friend. 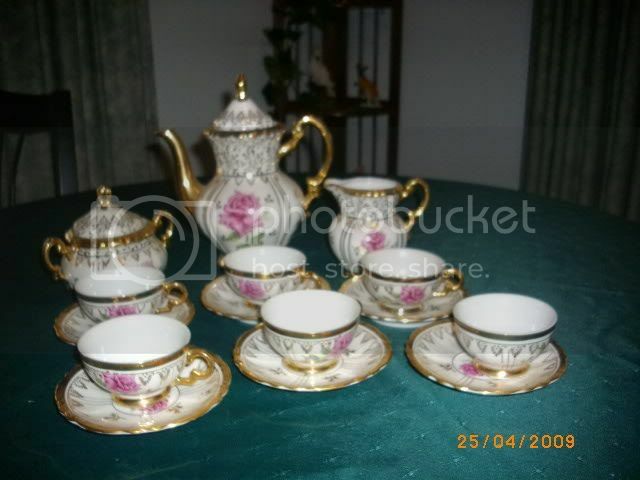 Beautiful tea sets, Sue! is the second Royal Dalton? No I dont think its Royal Doulton, it does not say that on the bottom. And yes, that painting is fantastic. I will take another photo of it tomorrow, and hopefully wont need the flash, so that big bright spot wont be on the picture. My cousins name is Terry Johnstone. There are quite a few articles mentioning him on the web. We were all very close when we were kids. Terry is the eldest of 8 children of my mums sister, Aunty Ivy. Her husband, walked out on her when her youngest was only a few months old. As kids there was never any mention of their aboriginal heritage, which came from their father. Terry had a troubled life, and suffered from alcoholism, and it was the Aboriginal contacts that he made, help him stop drinking, and gave him an opportunity to do art....and the rest is history. We are all very proud of him. That’s such an inspirational story about your cousin, Sue. I’m so glad he managed to turn his life around and has achieved such success as an artist. When George and I first set-up house together in the early 1970s, we had to start from scratch. 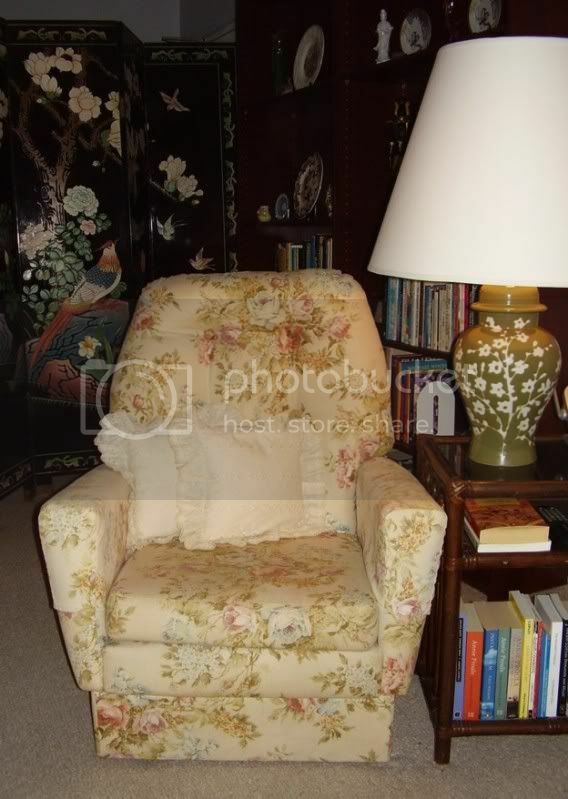 We had to buy everything new – furniture, appliances, linen, lamps, ornaments, etc. One of the first ornaments we purchased was this hand carved soapstone figurine. It’s 20cm (8in) in height and means a great deal to me. I named him the guardian of our home, because of the way his hand is resting on the hilt of his sword, ready to draw it in our defense. His facial features, hands, plaited hair and clothing are all beautifully carved in the most minute detail. I still think of him as the guardian of my home. I love your tea services Sue. I especially like the one with the roses. The deep red color is absolutely gorgeous. And I also love the painting. Being Native American I have always appreciated the Native Aboriginal artwork. It's very beautiful and in many ways I think it resembles the Native artwork here in North America. The art tells a story and the more you look at it, the more you begin to understand it. It's almost hypnotizing in a way. Very beautiful Sue! Thanks for posting it! Thats such an inspirational story about your cousin, Sue. Im so glad he managed to turn his life around and has achieved such success as an artist. When George and I first set-up house together in the early 1970s, we had to start from scratch. We had to buy everything new  furniture, appliances, linen, lamps, ornaments, etc. One of the first ornaments we purchased was this hand carved soapstone figurine. Its 20cm (8in) in height and means a great deal to me. I named him the guardian of our home, because of the way his hand is resting on the hilt of his sword, ready to draw it in our defense. His facial features, hands, plaited hair and clothing are all beautifully carved in the most minute detail. There's a lot of detail in that little statue Kerry. I'm glad you have a guardian in your home. If you hadn't told me the statue was soapstone I would have thought it was jade. As you said, that statue is very important to you and I can clearly understand why - it is something you and George bought together.